We’ve been dreaming of building Mars habitats for centuries if not millennia. Often, the creative minds of science fiction writers, artists, poets and others have paved the way forward, allowing us to push our boundaries and reach for the stars. Their visions are made possible through the subsequent development of incredible technologies that underpin magnificent achievements like landing people on the Moon. The creative minds that fueled our dreams are a crucial part of the process of space exploration. Last October, I had the privilege of giving a virtual talk to students at the Sigaram Academy of Excellence from Mulagumooodu, K.K. Dist, Tamil Nadu, India. At the end of the talk, I challenged them to create and share their visions of future Mars habitats. The response we received at OeWF was phenomenal. 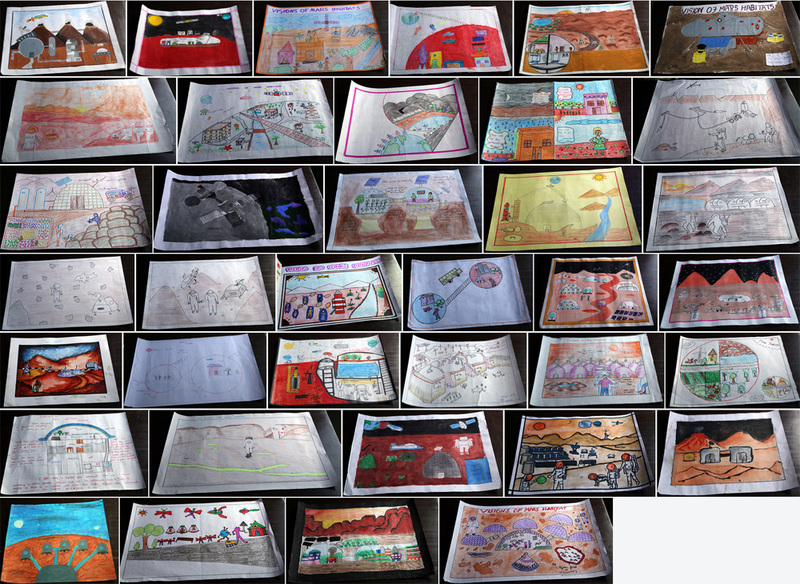 In all, we received 37 entries, each taking the viewer on a wondrous journey of exploration. In light of this, the OeWF has decided to award each student with a special OeWF goodie bag. I invited a team of enthusiastic OeWF members and Analog Astronauts to help me review the submissions. Although all of the students are winners in our eyes, we have decided to pick a few standout entries: one for each age group, from which we picked the overall winner. Rixshana’s vision really captured the imagination of the OeWF judging panel. Somewhat abstract in nature, we felt that Rixshana wonderfully depicted the loneliness of space. The juxtaposition of two docked spacecraft against the grey backdrop of what is presumably the Moon is interesting because the Moon is often considered the gateway to Mars. The abstraction of the Earth near the right bottom of the drawing adds to its mistique. 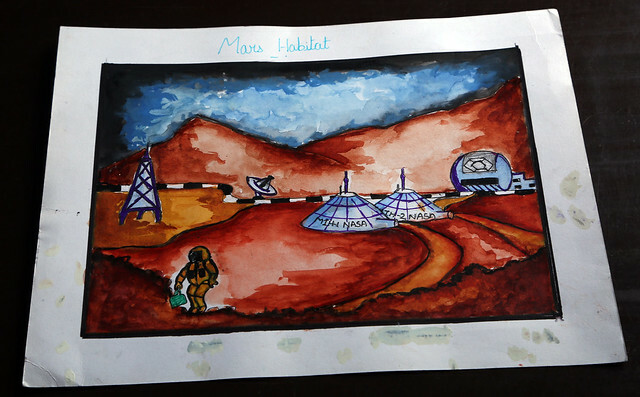 Overall, the judges felt that although Rixshana’s drawing wasn’t of a habitat on Mars, it generated a sense of the vastness of space and the role that the Moon has to play in our quest to land on the Red Planet. The OeWF judges loved Antric’s entry. The simplicity of Antric’s vision of a human habitat on Mars is a reflection of the huge technological, physiological and psychological leap that we have to make before we are in a position to land there safely. The attention to detail in the form of food storage outside the central habitat and the communication dish on top of its roof is commendable. 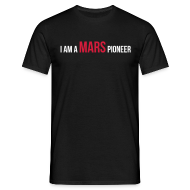 Although Mars does not currently have active volcanoes, they are an important ingredient in our current understanding of how various geological features came to be. For instance, Olympus Mons, belonging to the Tharsis Complex, is not just an inactive volcano, it is also the highest mountain in the Solar System, standing at over three times the height of Mount Everest! This reflection on the past, in contrast with the future vision of a habitat on Mars truly captivated the OeWF judges. Vishnu managed to capture the essence of a host of ideas and concepts that are likely to play a crucial role in supporting human life on Mars. His depiction of a future, human habitat on Mars could have been taken out of the notebook of any NASA, ESA or ISRO engineer. The attention to key elements, such as the communications system to relay messages back to Earth, the various habitat modules and the Extravehicular Activity (EVA) spacesuit worn by the astronaut outside the habitat is marvelous. Moreover, not only did Vishnu manage to capture a scene that could have belonged to the storyboard of The Martian, the incredible contrast of colours and textures reflects a deep artistic sense. In short, the OeWF judges loved this entry, both for its depiction of the elements of a future Mars habitat and for its aesthetic beauty. Anshio’s futuristic depiction of a Martian colony is riveting. There are so many elements within the drawing, each helping to tell the story of how future Mars pioneers will live on the Red Planet. 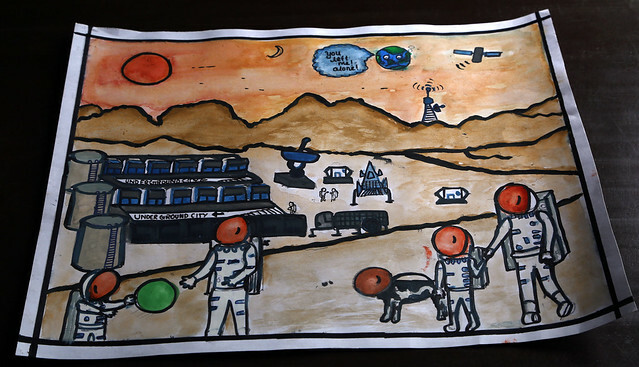 The drawing captures the whole communications system, including the ground segment and potential communication with relay satellites around Mars. Anshio also includes a number of details, like the underground city, which astronauts would use to remain shielded from harmful high-energy particles and cosmic rays. The group of astronauts in EVA suits, presumably a family, throwing a ball around with the dog looking on brings a sense of warmth to this vision of life on Mars. Finally, the Earth clearly seems to be upset to be missing out on all the fun! Aarcenis manages to include a lot of different aspects of a future Mars habitat in this drawing. In contrast to a lot of other entries, Aarcenis positions the habitat as being underground, which is something that has been considered by engineers. The main reason for putting the habitat underground is to take advantage of the natural shielding from harmful radiation. The drawback comes from the difficulty in creating deep tunnels on Mars; however, it might turn out to be possible to make use of existing geological structures for this purpose. 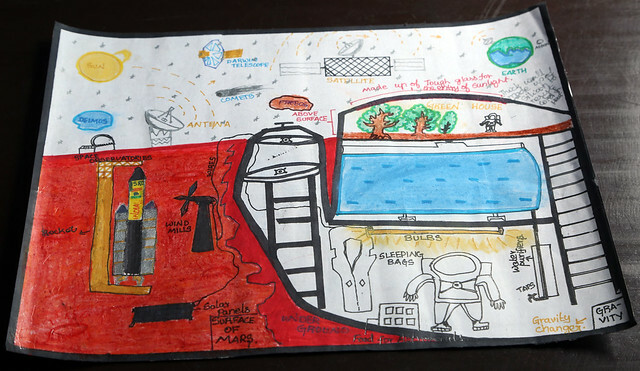 Aarcenis manages to pack a lot of detail into the drawing, including the communications antennae, the ascent rocket that would be use to lift astronauts off the surface, as they embark on their journey back to Planet Earth and a multi-functional water tank that would provide some level of radiation shielding, water for the astronauts to consume, and irrigation for plants grown within the greenhouse. 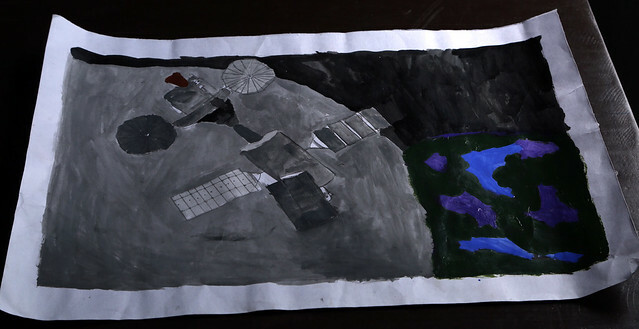 The OeWF judges were impressed by this overall vision of how a Mars habitat would take shape. 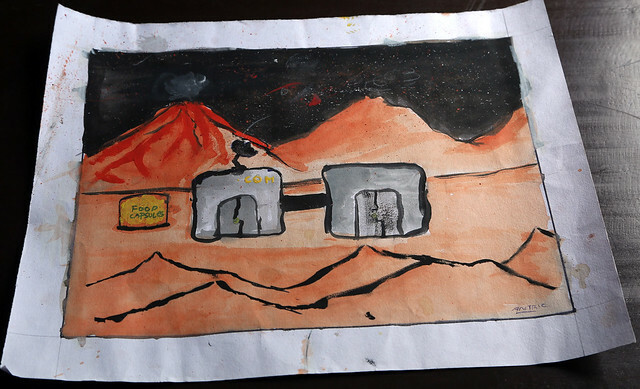 After careful consideration, the OeWF judges felt that one drawing really captured the vision of what life could look like for the first human inhabitants on the Red Planet. The winner is … Vishnu Murugan, from the 8th grade! Congratulations! May your creative imagination continue to spawn fantastical visions that guide us on our journey amongst the stars! Thank you to all the students at Sigaram Academy of Excellence for their enthusiasm, motivation and incredibly creativity. We look forward to all of you joining our quest to step foot on the Red Planet! Thank you to the teachers and staff members at Sigaram Academy of Excellence for supporting our outreach efforts. And thank you to my OeWF colleagues who helped me through the difficult task of judging these fantastic submissions. You can browse through all of the entries by clicking here. Let us know what you think!